Mel - Grandad - Cap. Melvin O. Barker was born May 9, 1924 in Waco Texas to Cecil and Era Bell Barker. He married Wilma Marguerite Penny on June 7, 1946 in Amarillo Texas. Margie Barker died August 3, 1992. He married Edna Marilyn Coberly November 17, 1992. Edna died March 27, 2006. He served in the United States Navy and WWll. He retired from the Lacey fire department as Captain. He has been a long-standing member of St. Andrew’s United Methodist Church. He held board positions for the Lacey Kiwanis Club and the Lacey stroke club. He volunteered for panorama city retirement facility where he was a resident. 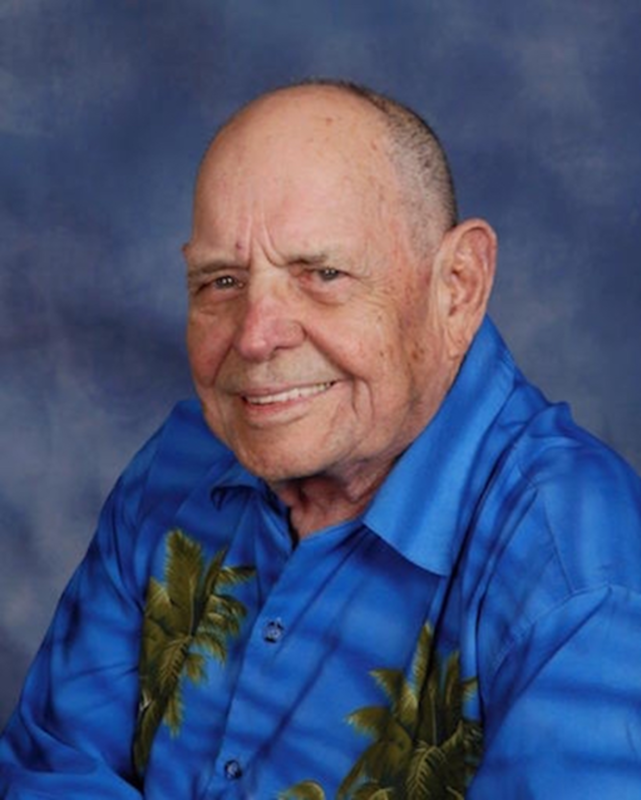 His interests included golf, traveling and visiting family and friends. He is survived by his son-in-law, Larry R Dowty. Granddaughters, Jeri Plews (Chris Plews) and Toni Gillespie (Rick Gilllespie) six Great Grandchildren, Sean (Elizabeth), Travis, Alex, Trittany (Brian), Chase, Kallen, and four Great Great Grandchildren. He was preceded in death by his daughter, Pamela K. Dowty on September 6, 2016. November 18, 2016 at 2:00 p.m.
Friends and Family, we are gathered here to praise God and to witness to our faith as we celebrate Mel’s life. We come together in grief, acknowledging our human loss. May God grant us grace, that in pain we may find comfort; in sorrow, hope; in death, resurrection. 1. Amazing Grace! How sweet the sound that saved a wretch like me! I once was lost, but now am found; was blind, but now I see. 2. 'Twas was grace that taught my heart to fear, and grace my fears relieved; how precious did that grace appear the hour I first believed. 3. Through many dangers, toils, and snares, I have already come; 'tis grace hath brought me safe thus far, and grace will lead me home. 4. When we've been there ten thousand years, bright shining as the sun, we've no less days to sing God's praise than when we first begun. REMEMBRANCES - Memories in photographs. 1. Silent night, holy night, all is calm, all is bright round Yon Virgin mother and child. Holy infant, so tender and mild, sleep in heavenly peace, sleep in heavenly peace. 2. Silent night, holy night, shepherds quake at the site; glories stream from Heaven afar, heavenly hosts Sing alleluia! Christ the Savior is born, Christ the Savior is born! 3. Silent night, holy night, son of God, love's pure light; radiant beams from thy holy face with the Dawn of redeeming Grace, Jesus, Lord, at thy birth, Jesus, Lord, at thy birth. We will begin with a reflection from Jeri Plews, Toni Gillespie, and Fire Chief Steve Brooks will offer condolences on behalf of Lacey Fire Department. Following their thoughts other family and friends who may wish to voice their thankfulness to God for the grace they have received through Mel’s life are encouraged to do so. Heavenly Father, receive Mel into the arms of your mercy. 1. On a hill far away stood an old rugged Cross, the emblem of suffering and shame; and I love that old Cross, where the dearest and best for a world of lost sinners was slain. So I'll cherish the old rugged Cross, till my trophies at last I laid down. I will cling to the old rugged Cross, and exchange it someday for a crown. 2. Oh, the old rugged Cross, so despised by the world, has a wondrous attraction for me; for the dear Lamb of God left his glory above to bear it to dark Calvary. So I'll cherish the old rugged Cross, till my trophies at last I lay down. I will cling to the old rugged Cross, and exchange it someday for a crown. 3. To the old rugged Cross I will ever be true, it's shame and reproach gladly bear; then he'll call me someday to my home far away, where his glory forever I'll share. So I'll cherish the old rugged Cross, till my trophies at last I lay down. I will cling to the old rugged Cross, and exchange it someday for a crown. On behalf of Mel’s family, we would like to thank all of you for sharing this time with us, and thank you for being an important part of Mel’s life. The family invites you to join them for a time of fellowship immediately following the service. Following the time of fellowship there will be a graveside interment. The pall-bearers: Rick Gillespie, Chris Plews, Dave Lepore, Sean Burgin-Foster, Brian Heggie, Travis Foster, Fire Chief Steve Brooks and Deputy Fire Chief, Gary Pearson. To the Lacey Fire Department for bringing the Antique Fire Truck that Mel helped with the restoration efforts. Maria Breznau for providing piano accompaniment. Panarama City Nursing Home, Gentle Care Unit. Funeral services were Friday, November 18, 2016 at 2 pm followed by a graveside service and reception at Woodlawn Funeral Home and Cemetery, Lacey, WA. No viewing is scheduled. Melvin O Barker Melvin O Barker 92, died November 11, 2016 with his granddaughters by his side in Lacey, WA., Panorama City Nursing Home. A funeral with graveside service, reception, military and civil service honors will be held at Woodlawn Funeral Home & Cemetery on Friday, November 18, 2016 @ 2pm. Mel was born May 9, 1924 in Waco, TX to Cecil and Era Bell Barker. He married Wilma Marguerite Penny on June 7, 1946 in Amarillo, TX. Margie Barker died August 3, 1992. He married Edna Marilyn Coberly November 17, 1992. Edna died March 27, 2006. He served in the United States Navy and WWII. He retired from the Lacey Fire Department as Captain. He has been a long standing member of St. Andrews United Methodist Church. He held board positions for the Lacey Kiwanis Club and the Lacey Stroke Club. He volunteered for Panorama City Retirement Facility where he was a resident. His interests included golf, traveling and visiting family and friends. He is survived by his Son in Law, Larry R. Dowty. Granddaughters, Jeri Plews (Chris Plews) and Toni Gillespie (Rick Gillespie), 6 Great Grandchildren, Sean (Elizabeth), Travis, Alex, Trittany (Brian), Chase, Kallen, and 4 Great Great Grandchildren. He was preceded in death by his Daughter, Pamela K Dowty on September 6, 2016. Donations may be made in his name to Panorama City Nursing Home, Gentle Care Unit.